Drumagog is a real-time audio plug-in that replaces the sound of your recorded drums. Don't like the sound of your snare? Insert Drumagog on the snare track and choose a new sound; Drumagog automatically plays the new snare in place of the original. for Drumagog 5's new triggering engine. drum hit. All room and mic samples maintain a phase-lock with each other. and faithful to their original articulations. for easy access to a virtually unlimited library of samples. comes with a custom IR library and the ability to read standard IR files. unmatched by anything else on the market. 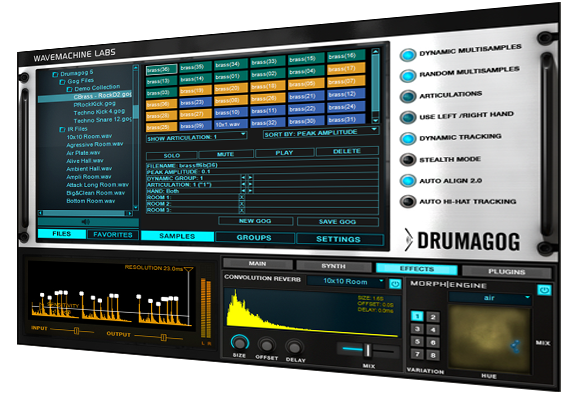 - Bleed Reduction feature allows Drumagog 5 to eliminate other drums from bleeding into a track and adding unwanted triggering. Simply setup Drumagog on each affected track and it will automatically remove the bleed. - Added Over 2 GB of samples to free library. Now includes the entire Rock Drums 3 and Ultra Drums libraries from Farview Recording. Free library is now nearly 7 GB total.